Rain showers early, then clear overnight. Thunder possible. Low 47F. Winds NW at 10 to 20 mph. Chance of rain 60%.. Rain showers early, then clear overnight. Thunder possible. Low 47F. Winds NW at 10 to 20 mph. Chance of rain 60%. Editor’s note: The following was written by Gary Schnitkey, University of Illinois ag economist, and Laura Gentry, University of Illinois Department of Natural Resources and Environmental Sciences, for the university’s Farmdoc Daily website March 19. Spring field operations will soon begin, and nitrogen applications on corn will commence. More nitrogen will be applied this spring than is typical because wet weather limited fall applications. University-recommended nitrogen application rates in Illinois are between 140 and 180 pounds of actual nitrogen per acre for corn-following-soybeans. For farmers applying above those rates, application reductions seem prudent this year. Two economic factors suggest urgency in lowering nitrogen rates this year. First, net incomes on Illinois farms could be extremely low in 2019. Projections indicate average income on grain farms enrolled in Illinois Farm Business Farm Management could be -$55,000 per farm if prices maintain their current levels and yields are not exceptional. This average income would be the lowest since FBFM began collecting consistent income data starting in the 1970s. Given these low incomes, reducing costs is crucial, particularly if those costs do not increase revenue. Second, nitrogen fertilizer prices in 2019 have been increasing and will be above levels of the last three years. 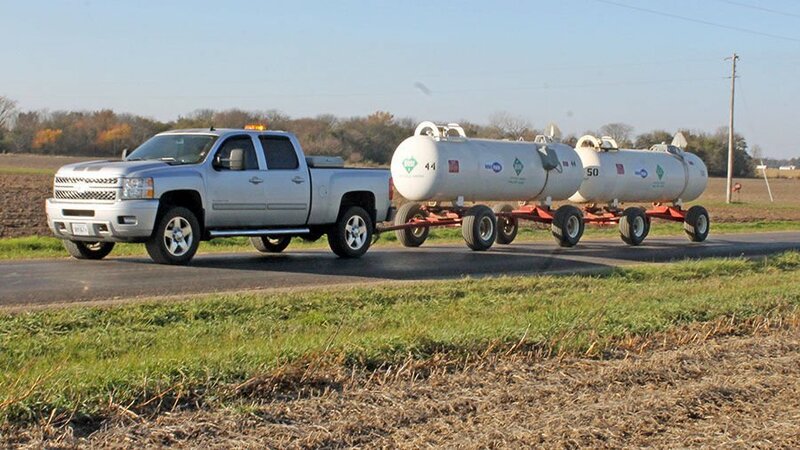 On March 14, the Agricultural Marketing Service (AMS) — an agency of the U.S. Department of Agriculture — reported an average anhydrous ammonia price in Illinois of $615 per ton, which is $97 per ton above the 2018 March average price. A higher nitrogen price suggests lowering applications, particularly given that the 2019 expected corn price is roughly at the same level as in 2017 and 2018. “Maximum Return to Nitrogen” (MRTN) rates are available from the Corn Nitrogen Rate Calculator at http://cnrc.agron.iastate.edu, a website maintained by universities in Corn Belt states. MRTNs also are given where the source of nitrogen is anhydrous ammonia and 28% nitrogen solution. Note that the rates in Table 1 include all sources of nitrogen, and credits should be given for nitrogen in DAP. Take Central Illinois as an example in interpreting the table. For corn-following-soybeans, MRTN rates are 174 lbs. 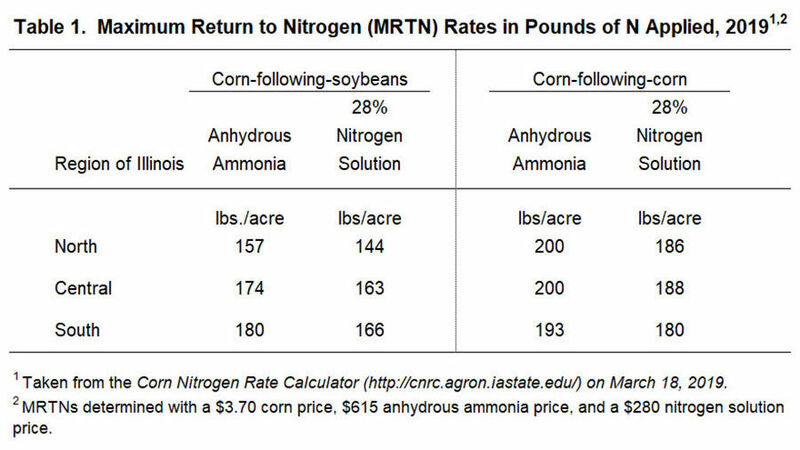 of nitrogen per acre for anhydrous ammonia and 163 lbs. of nitrogen per acre for 28% nitrogen solution. Those rates are pounds of nitrogen applied per acre and not the amount of ammonia or solution applied. For anhydrous ammonia, the 174 lbs. of nitrogen results in an application of 212 lbs. of anhydrous ammonia. For nitrogen solution, the application is 582 lbs. per acre of 28% nitrogen solution. Prices used in the calculations of MRTN rates are $3.70 per bushel for corn, $610 per ton for anhydrous ammonia and $280 per ton for 28% nitrogen solution. Lower MRTNs result for 28% because nitrogen costs more in 28% than in anhydrous ammonia. The costs per pound of nitrogen in anhydrous ammonia is 37 cents per pound compared to 50 cents per pound cost for 28 percent. Applications of nitrogen above MRTNs have additional costs. Given the nitrogen prices above, every 10-pound application of actual nitrogen applied above the MRTN has a cost of $3.70 per acre for anhydrous ammonia and $5 per acre for 28%. For anhydrous ammonia, 1 additional bushel of corn is needed to compensate for the higher nitrogen costs. For 28%, 1.35 bushels of corn are needed to cover the costs of 10-pounds of additional nitrogen. Costs increase as pounds of over-applications increase. Take an application that is 50 pounds above the MRTN. For 28%, this application will have an additional cost of $25 per acre. A farm with 1,000 corn acres would have $25,000 higher costs, and $25,000 less net income. The MRTN takes into consideration many trials, and higher yields will occasionally occur at rates above MRTNs. Over time, however, profits should be maximized at rates near the MRTN. For example, the 6.8 bushels increase to 13.6 bushels per acre if the additional application only increases yield in 50 percent of the years. The break-even yield further increases to 27 bushels per acre if the yields respond only in one in four years.